I moved to the oil field and decided I needed a guard dog. Not only would the extra protection be nice, but I could use a companion, someone to run with, someone to listen to my problems, someone who would always be there for me. Living on a farm makes having an animal quite easy, so the living arrangements wouldn’t be a problem. I could hardly say no. This tiny, four-month-old blob of fur had been left at Jack’s neighboring farm, which had previously been an unwanted animal drop-off site. Besides, it made my decision easy. I didn’t have to search for a dog at a shelter or buy a particular breed, and I could feel good about saving an animal and giving her a home. Lucy, as I named her, quickly became part of my daily life. When I left her in the mornings for school, she would stare at me forlornly from the yard. When I came home, she would accompany me enthusiastically on a 30-minute walk on a dirt trail before I began cooking dinner for the boys. She was rambunctious, outgoing, and irresistible. Everyone grew to love her, including Jake, our yellow lab, and Abby, my dad’s black lab (although she took a little longer to come around). Lucy is cute, I will give her that. 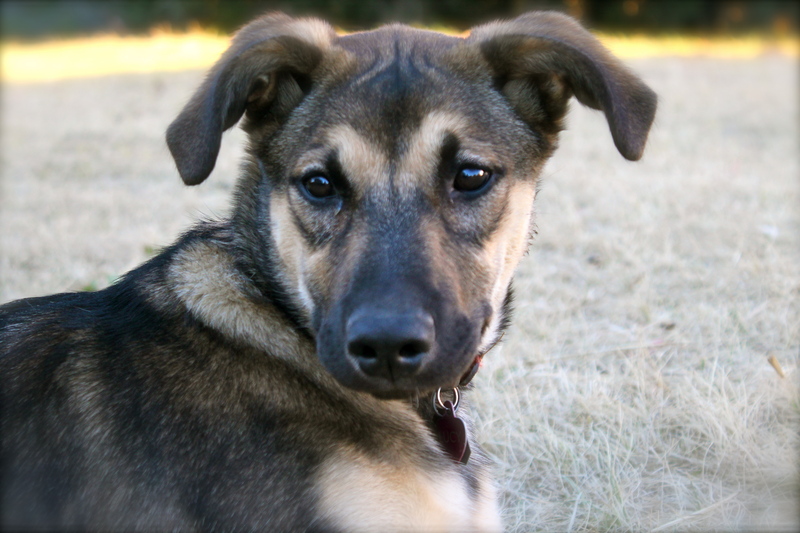 She has the right coloring for a German shepherd, her distinctive black-and-tan face made especially expressive by markings that look like raised eyebrows. As she grew, however, eventually becoming taller and lankier than our other dogs, it became clear that she was no purebred German shepherd. Part German shepherd, certainly, but her ears stayed floppy like a lab’s, her tail curled over like a husky’s, and she doesn’t have the body type. She looks like a conglomeration of different breeds. Even more, it became quite clear that she is no guard dog. If I ever go out into the yard at night, Lucy is the opposite of helpful — she actually scares me more, jumping at every tiny sound and staring intently into the dark before bolting back into the garage to hide in the corner. Very reassuring when you are outside in the dark with the wind blowing eerily in the trees. I once found myself hiding in a locked house with a shotgun, and I blame the incident entirely on Lucy. So what is Lucy good at? They say certain breeds are happiest when they have a “job,” a dog career of sorts, whether it’s hunting, herding, guarding, guiding, or policing. 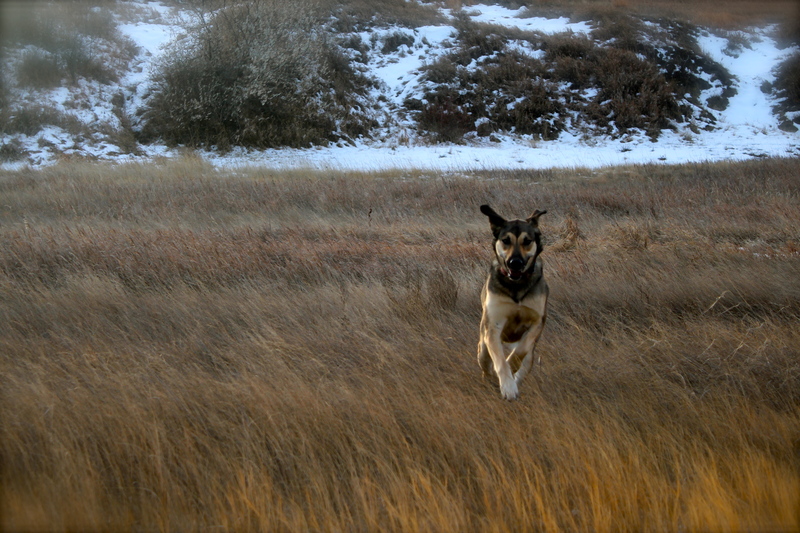 She’s no cattle dog: We have no cattle anymore. She’s no guard dog: That’s been proven. She loves to chase up birds, but she’s no hunter: She won’t listen. In fact, Lucy is just plain naughty. She chews up boots, eats rotten grain, drags the little barn cat Saul around the yard, visits the neighbors miles away, leaves dead birds at the bottom of my stairs, poops in the garage on a regular basis (even when the garage door is wide open), barks nonstop at the horses every morning, and wrestles the other dogs relentlessly. My family loves to tease me about how terrible she is, and I have to admit that it’s somewhat true. She’s been trained; she knows how to sit and lie down and stay and come, but life is just too interesting for her to care much about all that boring stuff. 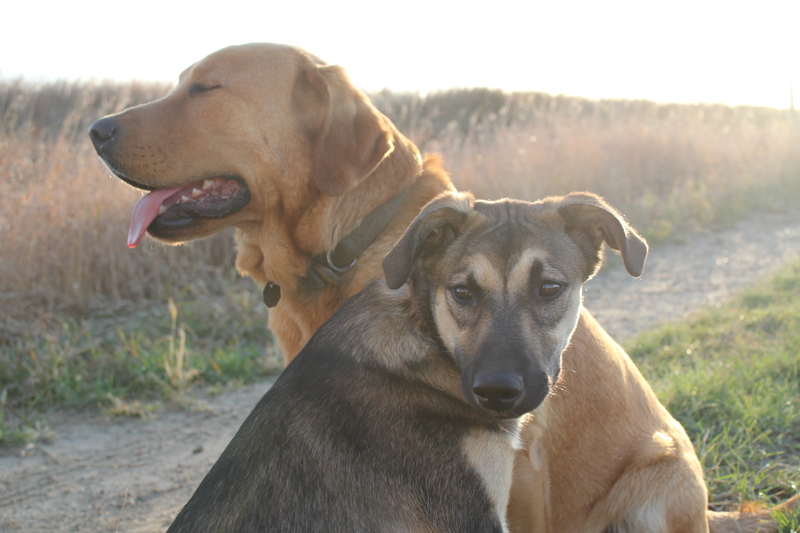 Lucy the German Shepherd conglomeration mix is probably better labeled as Lucy, the Terrible. I love her anyway, of course. But at last, this spring, Lucy has found a job. She has actually turned out to be somewhat useful. This is where Lucy comes in. 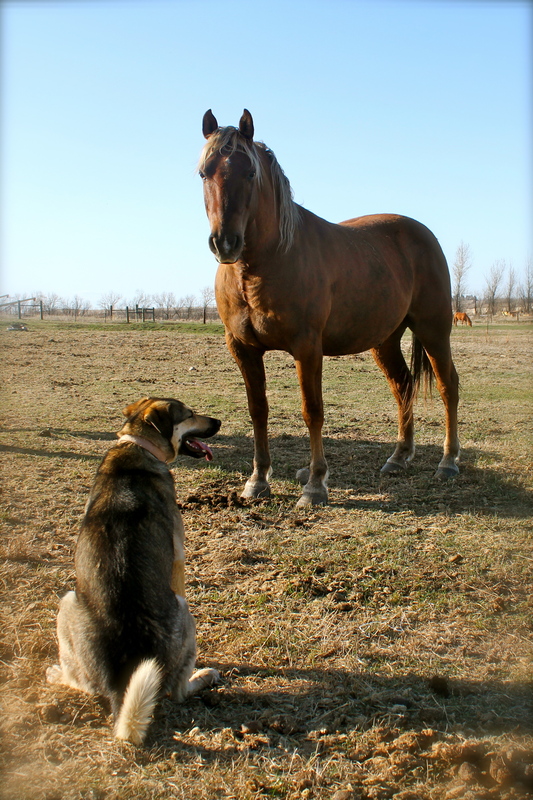 Ever since we brought the horses to winter in our yard pasture, her obsession with them has been almost unhealthy. She cannot leave them alone. Every morning, she barks at them for long periods of time. Some mornings, she herds them into a group or chases an individual horse just for fun. I shake my head every time I notice it. She’s going to get herself killed someday, I think. But through this obsession, she has become Chico’s personal sentinel. It’s wonderful. He gets out; she barks like crazy and keeps him at the fence. He gets out; she chases him across the yard to where he is supposed to be. The other day, Danny was trying to get him back into the gate. Chico wouldn’t budge. Danny called Lucy. Chico took one look at her flying across the yard full of fury and decided he would be better off in the pasture after all. If only she would spend as much time guarding me as she does keeping Chico in line. Chico, of course, doesn’t appreciate Lucy at all. But she’s turned out to be quite useful in this one regard. I can finally say, Lucy the Terrible may actually not be so terrible. On a side note: Does anyone have a guard dog for sale? Lucy the Terrible keeping an eye on Chico. Lucy breed….a canardly of course….you “can Hardly” tell what she is! Love your story! Good save! At some point in their lives everyone has a dog like this. I just stumbled upon the picture of Lucy. She looks like the puppy we just got who we named Maya. She is a husky lab mix and I’m hoping her ears stay floppy like Lucy’s! I’d love to send you a picture of her if you’d like.